4 bed, 2.5 bath home with a bonus sleeping room. Master bedroom is on first floor and has a queen size bed. Master bath features both a walk in shower and separate jet tub. Two bedrooms upstairs each have a queen bed and share a hallway full bath with tub/shower combination. A bonus sleeping room adds a 4th queen bed and is accessed through the 3rd bedroom. Large living area has a wood-burning fireplace, large flat screened tv with satellite programming and a DVD player. Kitchen has a dishwasher, full size refrigerator, microwave, drip coffee maker and is fully equipped with pots & pans and service for 8 or more guests. Home does have a washer/dryer and includes WIFI to stay connected while on vacation. Deck wraps around 3 sides of the home with about half of the area covered. In addition there is a detached deck located behind the home on the rivers edge. There is a gas grill available to guests on the deck. Enjoy biking right from the home and only a few minutes to HIKING trails, the LAKE and MARINA , HORSEBACK riding, ATV trails & rentals, restaurants and stores. We had an awesome time here in the Vallecito area. The house is beautiful, was clean, and had everything we needed. The location is gorgeous and we thoroughly enjoyed the deck by the creek. So peaceful and relaxing! Thank you for sharing your home. We also had a blast on the Altitude ATV razors we rented and really enjoyed dinner at Pura Vida on the Vallecito Reservoir. Beautiful!! What a beautiful home that didn't seem like a rental at all. It felt like home. The kitchen was well supplied for all our cooking needs. My favorite was the awesome deck by the river. You couldn't ask for a more relaxing place to soak-up the morning sunshine and the wonderful view. Can't wait to come back and visit again soon. We just got home from a weeks stay here. We were so pleasantly surprised by the quality of this place! The nearby creek was just beautiful and so pleasant to sit by and relax. The house was perfect and nicely furnished and equipped. We had everything we needed. The location was equally surprising. We had plenty of hiking and fishing nearby that kept us occupied. We were about 45 min out of Durango so we could do the things that are fun to do in that area. Couldn't have been happier with this house for our vacation! We loved our week at Riversong. We loved the layout and extra room. The kitchen had everything we needed for a week of cooking with children and grandchildren. There are 2 dining tables which made dining and game playing great! We would definitely stay there again!!! Doug and Connie were so nice to deal with and so sweet!!! Absolutely a beautiful spot on the Vallecito creek. The house was very nice and comfortable. Very well supplied with utensils and dishes. We spent a lot of time out on the deck by the creek and exploring the beautiful area around the house. The Allen's were so helpful and very nice. Thank you for letting us stay at your home. Now we head home to California. This cabin is awesome and so is the area. The cabin is warm,cozy,spacious and welcoming. The stone fireplace is beautiful, kitchen is spacious and bedrooms are very comfortable. At times deer and eagle can be seen when looking out of the windows! 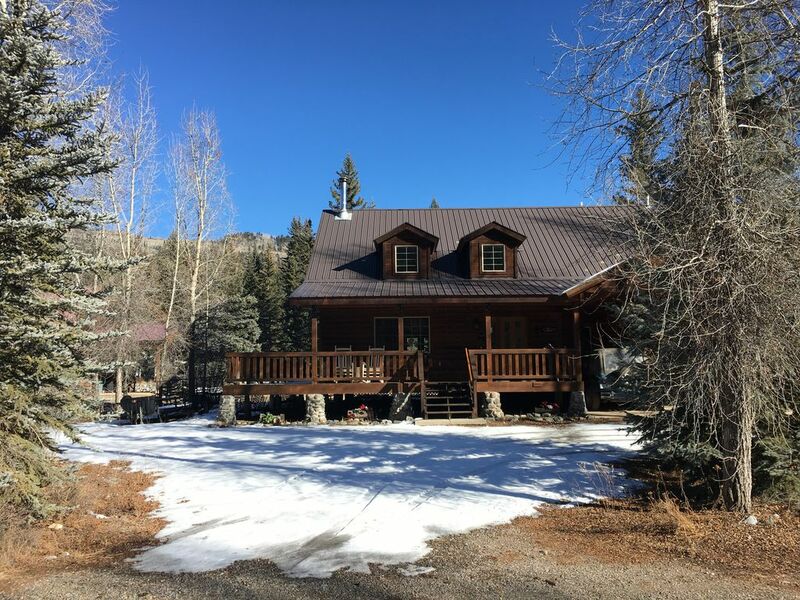 Cabin location is remote enough to feel secluded but close to amenities. Our favorite feature was the wonderful deck in the backyard where we saw salmon running up the adjacent river. Such a great place to relax and enjoy refreshments after a long hike. Horseback riding and ATV adventures are also available in the nearby area. My husband and I can't wait to go back! The Base Rate on the home includes up to 4 persons. Additional persons are $20 per night. Maximum of 8 persons. Pet Fee includes 1 approved pet for up to 7 nights. There would be a charge of $15 per night plus tax for each night beyond 7. Additional pets, if approved, would each incur a charge of $15 per night plus tax. Maximum of 2 pets.